Playwright Alex Dennison (Alex Ferns) is mourning the loss of his leading lady - and fiance - Monica Welles (Susie Amy), who apparently committed suicide following her West End stage debut. A year later the cast and crew re-assemble at the same theatre to read his new play - a mystery echoing the events of a year before. The cast soon realise that the scenes eerily resemble encounters they may or may not have had with Monica and it becomes apparent that Alex believes that one of the persons present is, in fact, guilty of her murder. Originally a television film written by Richard Levinson and William Link, creators of "Columbo" and "Murder, She Wrote", this adaptation by David Rogers is the first presentation of the Classic Thriller Theatre Company which replaces the successful Agatha Christie Theatre Company. The adaptation is well constructed with some witty lines but there are some clunky elements - none more so than the clichéd Welsh assistant (Georgia Neville) who becomes quite a distraction because of the unsteady accent - and the play is a bit of a slow starter but soon picks up. There are a few over-the-top moments in the second act but Roy Marsden's direction is generally simple and clean and his use of theatrical devices, including his handling of the intrusion of the past into the present, is entirely appropriate as is the set and costume design by Julie Godfrey. Dan Samson's sound design is a little wanting and the occasional use of dull, obvious, movie-of-the-week music is uninspired. The lighting by Doug Kuhrt is atmospheric and used efficiently even if it does leave the occasional actor in semi-darkness. For the most part each cast member has a decent part to play, although some are more successful than others with some of the weaker elements, including a variety in the quality of vocal projection, highlighted against the stronger. Alex Ferns is strong and dominant as the playwright out for truth and he has hardy support from the charismatic Mark Wynter and the firm Ben Nealon amongst others as the actors in his play. Susie Amy as the deceased movie star has an appropriate aloofness and beauty whilst Anita Harris brings a class and glamour entirely suited to producer Bella Lamb. A solid, sturdy whodunit with a clever structure and intriguing twists this production keeps the audience guessing and is a worthy follow up to the Agatha Christie fare and a secure beginning for the Classic Thriller Theatre Company. 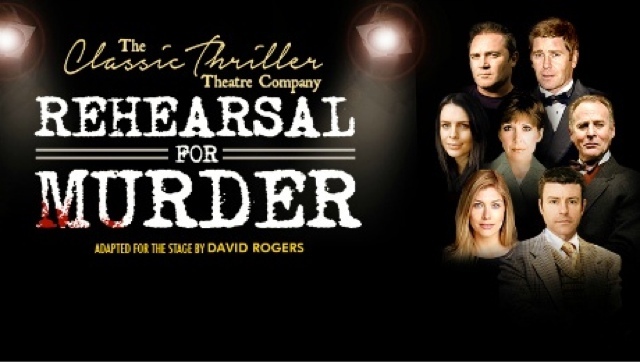 Rehearsal for Murder is at the Theatre Royal Glasgow until Saturday 27th August.